Like countless Gloucester fishermen before and since, Howard Blackburn and Tom Welch were trawling for halibut on the Newfoundland banks in an open dory in 1883 when a sudden blizzard separated them from their mother ship. 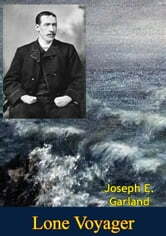 Alone on the empty North Atlantic, they battled towering waves and frozen spray to stay afloat. Welch soon succumbed to exposure, and Blackburn did the only thing he could: He rowed for shore. He rowed five days without food or water, with his hands frozen to the oars, to reach the coast of Newfoundland. Yet his tests had only begun. So begins Joe Garland’s extraordinary account of the hero fisherman of Gloucester. Incredibly, though Blackburn lost his fingers to his icy misadventure, he went on to set a record for swiftest solo sailing voyage across the Atlantic that stood for decades. Lone Voyager is a Homeric saga of survival at sea and a thrilling portrait of the world’s most fabled fishing port in the age of sail.—Print Ed.